1754-92. The elder son of Admiral Sir Edward Hughes’ second wife, a widow known at the time of their marriage in 1765 as Ruth Wheeler, the identity of his father is unclear, with various sources suggesting that he might have been a ‘Captain Ball’ whom Ruth met and may have married whilst she owned a store in the West Indies, or indeed that he might have been the illegitimate son of Hughes himself from a relationship with Ruth prior to his first marriage. 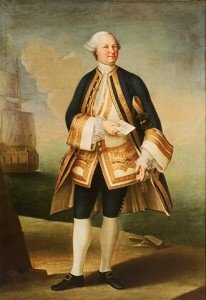 Ball was commissioned lieutenant on 17 November 1774 and posted captain on 25 January 1780, having risen from first lieutenant to become the flag-captain aboard the Superb 74 to his step-father, Vice-Admiral Sir Edward Hughes, the commander-in-chief in the East Indies. After superintending the landing of artillery, stores and provisions at the reductions of the Dutch bases at Negapatam and Trincomale in the winter of 1781-2 he reached home in May 1782 aboard the sloop Nymph, 14, Commander John Sutton, with letters for the government and the Dutch colours to lay before the king. In the summer of 1787 he made the newspapers when a ruby and gold ring set with other stones of great value, a gift from his mother, Lady Hughes, was stolen from his London residence in Charlotte Street, Portland Place. It transpired that the villain was his own black servant, who was committed for trial. In October 1787 Ball commissioned the Arrogant 74 at Chatham during the Dutch Armament. He died on 6 August 1792 at his residence in Hampstead, London, and was buried at St. Mary and All Saints, Lambourne, Essex, where his brother, mother and step-father were later interred. On 18 December 1782 at St. Margaret’s, Westminster, he married Jane Gould, the daughter of the judge advocate-general, Sir Charles Gould, who in 1792 became Sir Charles Morgan 1st Baronet. Within a year of Ball’s early death his widow re-married. He appears to have had a daughter, Mary, who was alive at the start of the 19th Century, but his stepfather’s immense fortune devolved upon Ball’s nephew, who subsequently became the famous socialite and dilettante known as ‘Golden Ball.